Dubbed or self-dubbed, “Cincinnati’s Finest Gastropub”, Nicholson’s Tavern and Pub was my choice for dinner for my one night in Cincinnati. This raises a few questions: why one night? Why a gastro pub? Why Cincinnati? Well, there’s a simple explanation to each of those questions. I was in Cincinnati because it was a convenient stopping point between Toledo and Nashville. I had planned to stay in Louisville, but I thought the extra distance to Cincinnati would make the last leg to Toledo that much easier. That covers two of the questions, now why choose a gastro pub? Once again, it’s an equally simple answer. I had read good things about Nicholson’s Tavern & Pub on Chowhound not to mention it’s hard to turn down a good pint of beer. To start, Nicholson’s does a pretty fine job with the liquor. There’s a sizeable collection of single malts not to mention a nice selection of drafts and bottled beers. They even have a Scottish draft brew shipped especially to them, although they were conveniently fresh out when I was there. One downside to Nicholson’s is the lack of televisions. With just one TV in the entire bar, it made watching the Thursday night game quite a challenge. Looking through my menu, my hopes of a H & F like selection of offal, house cured meats, terrines, and perfectly cooked burgers were dashed. Nicholson’s is much more of your standard bar fare. 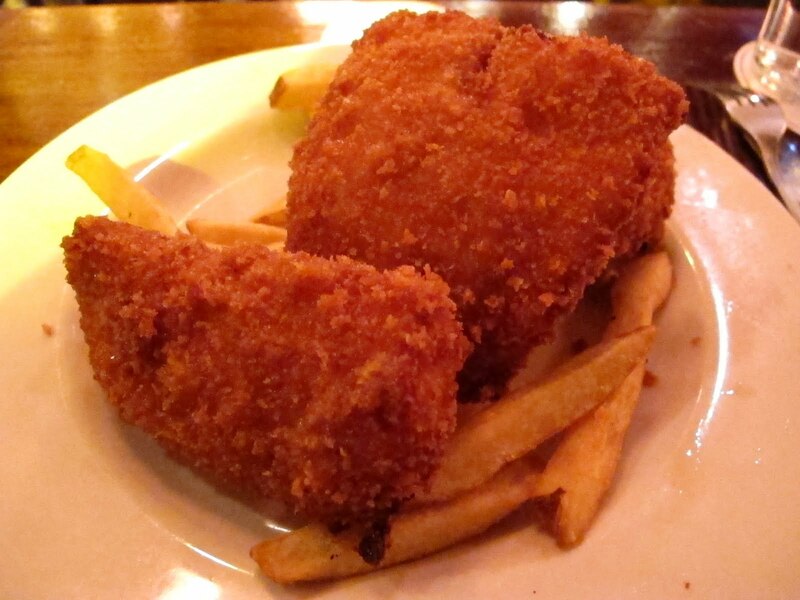 Sure there are a few novelties here and there, but it’s heavy on the fried food with a backing of the pub classics. 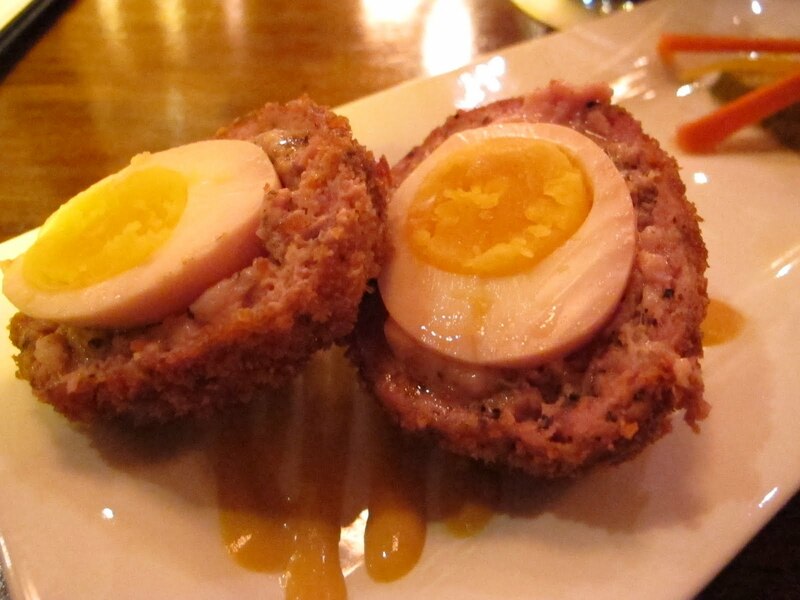 Feeling a bit disappointed, I decided to make the best of it and start with something familiar, a Scotch Egg. 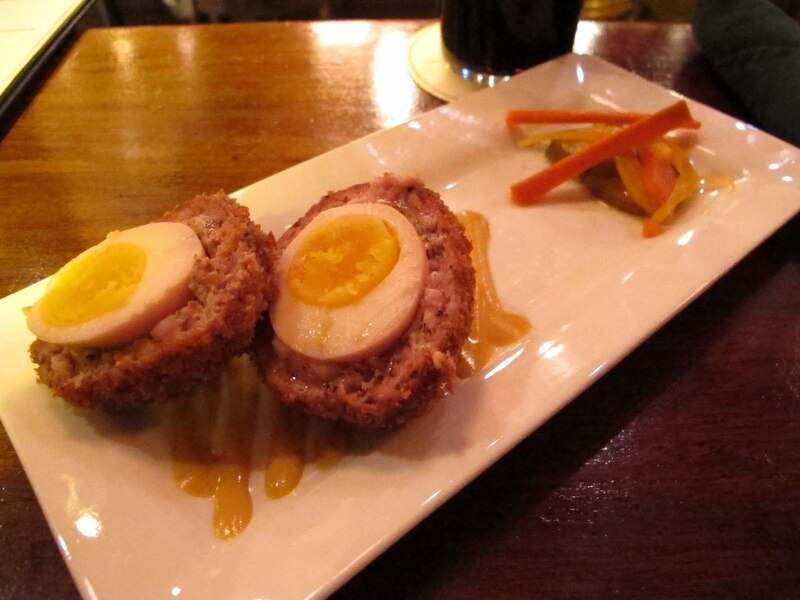 In the description, Nicholson’s was proud that this Scotch Egg was made with house made sausage and a “free range” egg. I usually don’t like boiled eggs, but there was a well cooked egg in the middle of this fried morsel. Surrounding that “free range” egg was a solid layer of simple, peppery sausage. Combined with a crispy crust and quality mustard, things were off to a good start. Hoping to continue in the same vein of deep fried pub goodness, the Fish and Chips was an obvious choice. 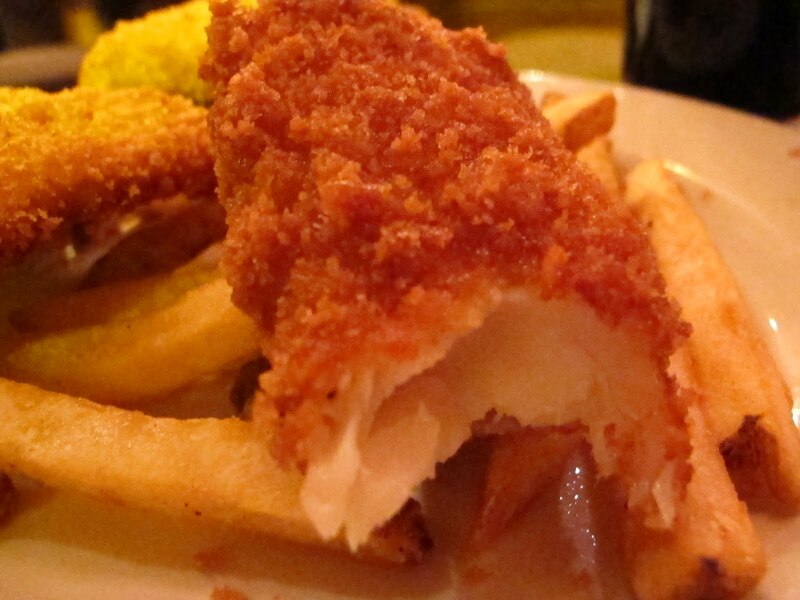 Instead of the traditional Atlantic cod, this version was made with a popular alternative, haddock. I wasn’t expecting magic on a plate, but for a gastro pub, I was hoping for a little more than two greasy filets on a pile of fries. Did I mention the fish was greasy? This fish was oily to the touch and more than a little overcooked. At least the fish had some flavor, the fries were unseasoned crap. After the waitress cleared away my unfinished plate of fish and chips, I was a little despondent. I couldn’t see the football game, my fish and chips were a let down, and it was cold inside the pub. 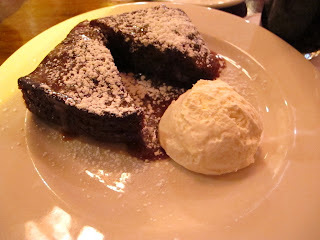 Maybe that’s why I decided it was a good idea to try the Sticky Toffee Pudding. Once again I was dreaming images of Holeman & Finch or Feast’s sticky toffee pudding, this pudding was burn your tongue hot, dried out, and overcooked. The booze laden sauce was allright but really overpowering. To sum up, this toffee was overcooked, loaded to the gills with dates, overrun with alcohol, and frankly pretty poor. Above the entry to Nicholson’s Tavern are the words “Cincinnati’s Finest Gastropub”. As I said in the beginning, I’m not sure if these words are self appointed or the sentiments of the citizens of Cincinnati. For me, I’m hoping there are better choices to be had in southern Ohio. After this trip, I’m not sure when I’ll be in Ohio or Cincinnati again. Maybe next time I can find a better spot for dinner and leave Nicholson’s Tavern for drinking. To each their own, I guess. It's not a sports bar and doesn't claim to be, but there are plenty of those in town if you want to watch the game. I happen to like the lack of televisions. Hope you have a better experience next visit!